Have you suffered with problematic skin long enough? As we are always striving to bring you the very best in result driven products and services. Training is an ongoing thing in the salon, keeping up with the latest trends and skills. When I became an Environ therapist nearly 7 years ago, I knew that I would forever be at the forefront of AMAZING skin care. Being able to help my clients with any skin concerns they may have is what I love the most. So when Environ launched a new treatment specially designed for the most troublesome skins, I HAD to go to and learn all about it! The nearest training centre for us at The Topiary is at the IIAA Head Office in London. They have recently redesigned their training school and moved premises, so I was excited to go and see what they have done! It was an early start for me, getting to London, Brent Cross station for 9am. 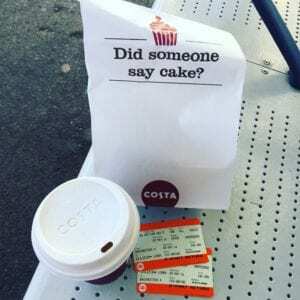 Fully fuelled with a Chai Latte and a Pain Au Raisin from Costa, I awaited a ridiculously busy train to take me to Waterloo. It makes me angry to think the amount you pay for a ticket and you still have to stand outside the toilet in the corridor. Surely there is a maximum number of people to safely travel on a train right? Arriving at Brent Cross Station, I jumped in a taxi and he took me through all the short cuts to get me to the IIAA HO on time. The first part of the morning is spent introducing yourself and telling everyone a little about you and your background of training and experience. We then went into the theory of facial peels and Environ. Now, most people know peels as a harsh treatment that strips your skin and leaves it red raw and exposed. This is mostly true… practitioners use an acid solution that heavily peels the skins layers. They can be unpredictable and it’s easy to over-peel an area. These acids penetrate the skin and destroy the damaged skin cells right down into the deepest layers of the Epidermis. It is normal for this type of peel to take 6 weeks or more to recover from, and a ‘down time’ is needed before going back to work or showing your face in public! Eeek! No thank you, i’d rather not! This is where Environ excels….. We use a slow-developing, cream peel. I-Lactic acid is used, as it is a ‘soft’ acid. It is also naturally active in the skin and tends to inhibit formation of pigmentation and aids the natural moisturisation of the skin. In this way, we can penetrate the skins layers without torturing the cells and destroying them. Instead, we heal them. Theory done, now we get to try out this amazing facial! Whoop! Whoop! This is what we’ve all been waiting for… Snuggling under a nice duvet and having a well deserved pamper (as lets face it, none of us therapists get time to have any treatments ourselves!). We start off with a Pre-cleanse and Cleansing Gel to de-grease the skin and get rid of any make-up etc. Then the LACM(Cool Peel) is applied. As i’m a long term user of Environ, and i use the strongest vitamin moisturiser, i get to have the stronger LACM solution and some super-duper vitamins applied afterwards too – i’m sooooo looking forward to having fresh glowing skin! The LACM is applied in layers. We start off with just 1 layer for the first facial and this is left on for 10mins. WOW it’s so tingly! 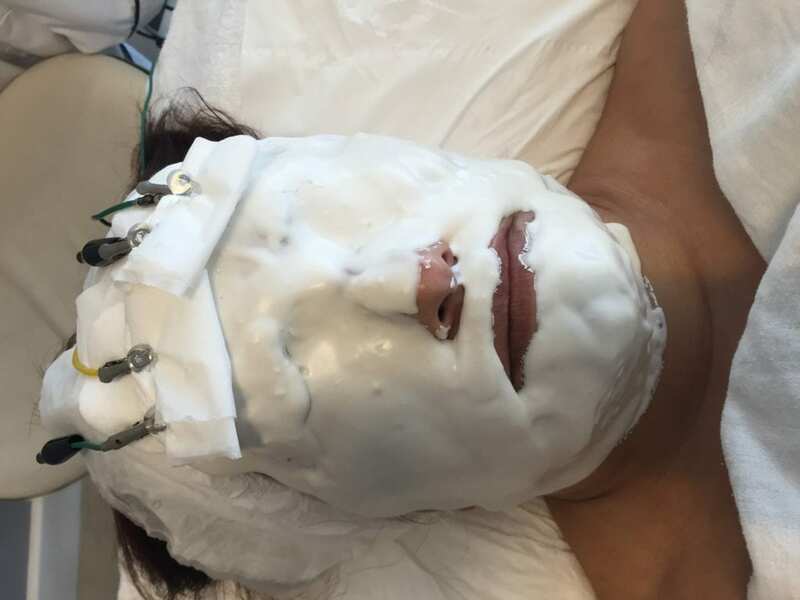 I have to admit, it wasn’t the most comfortable of feelings, I really wanted to scratch my jaw line where the cream was tingling the most, but I wasn’t allowed! We chatted a little to pass the time (in the real treatment you would have a hand and arm massage) and then finally the peel gets neutralised! This process consists of a lot of water and a foamy facial cleanser massaged onto the skin for 5mins. This felt amazing, getting rid of the tingling almost instantly! Once neutralised the super-duper vitamins were applied to my face & neck followed by the Alginate mask. This was my fav part! The mask is a cool paste that is applied thickly over the whole face, including the eyes and mouth but leaving the nose free so you can still breathe. (these parts are optional as you can leave the eyes and mouth open too if you wish) This makes you totally relax. You can’t open your eyes to see whats going on, you just lay there, listening to the relaxing music and enjoying a wonderful neck & shoulder massage! BLISS! The mask is attached to the Environ DF Machine which delivers a pulsing current over the face. The current helps to push the vitamins into the deeper layers of the skin where they are needed to help heal and normalise the skin. This feels a little tingly and you can see a dancing light in the eyes from the optic nerve. The Alginate mask smoothed over and attached to the DF Machine. A gentle beeping from the machine bought me back to the room where the mask is then removed and the moisturiser is applied to finish. My skin felt so soft and fresh! The next few days after the peel my skin felt amazing. I had a slight initial dryness just on my cheek areas (as im not a sufferer from problematic skin or Rosacea this facial isn’t ideal for my skin type so this was expected to happen) I didn’t have any redness or sore feeling and there was no need to have any ‘down time’. I applied my Jane Iredale Mineral Make-up straight away for my journey back home on the train and hailed a cab! We can now offer this AMAZING treatment in the salon to target problematic skins, Acne and Rosacea. These treatments prove to be really beneficial to those clients who can often struggle to find anything to help calm and soothe their problematic skin. A course of 6 is recommended as this treatment is accumulative. Taken once a week for 6 weeks. We have designed a course for this treatment, receiving 1 free facial when you pay for 5. If you or your teens/friends or relatives are suffering with their skin, point them in our direction! We can book a one to one free consultation to talk about their concerns and discuss a treatment plan tailored to their needs. P.S Is beauty really just skin deep? Hi, can you let me know how much the treatments are? The Cool Peel treatments are £60 each. Buy 5 get 1 free for the course of 6. Contact the salon on 01256 841381 or email beauty@thetopiarysalon.co.uk if you would like to book or come in for a free consultation.